We humans often understand things by exploring their relationships. Ourselves, for instance; just consider how many sweet or gritty stories you’ve seen about Olympic athletes’ family backgrounds over the last few weeks. Well, the American Birding Association’s Bird of the Year — the Evening Grosbeak— deserves no less. We’re going to look at its family tree today, at where it fits in the grand avian assemblage, at what makes it at once unique yet not so alone after all. cardinals (Cardinalidae), e.g., Blue, Rose-breasted, and Mexican Yellow Grosbeaks. The Evening Grosbeak belongs in the first of these: It is a finch. But what is a finch? I’m so glad you asked. Before we dive in, just take a moment to admire this incredible bird. The finch family, Fringillidae, comprises more than 200 species distributed throughout the Western Hemisphere and across Eurasia, Africa, and Indomalaya. Finches didn’t make it across Wallace’s Line into Australasia until humans helped them along, but they did accomplish at least one remarkable transoceanic voyage on their own. More on that in a moment. Fringillidae is a branch within a complex, crowded, and colorful part of the avian tree often called the “nine-primaried oscines.” The pipits and wagtails split off first within this group, then the finches, then several other families, including the longspurs, wood-warblers, icterids (New World blackbirds), emberizid buntings and sparrows, cardinals, and tanagers. For centuries, many birds were assigned to these families based primarily on their bill structures. But with the advent of techniques for analyzing DNA and the realization that bill shapes are so malleable as not to be a terribly useful indicator of relatedness, dozens of species are getting shifted around within this large group of families. And back to finches. “Finch” is an ancient word, coming to us from Old English via Proto-Germanic and Proto-Indo-European; this history reflects the familiarity humans have had with birds of this family for thousands of years. Most finches are seed-eating birds with stout, heavy bills. But not all. Many recent scientific studies, including a paper by Zuccon et al. (PDF), have helped clarify the finch family tree, which has three major branches. The first major branch of the finch family consists of just three Eurasian species: Brambling, Common Chaffinch, and Blue Chaffinch. The second, rather incredibly, contains the brilliantly colored Neotropical euphonias and chlorophonias, which were classified with tanagers for years, despite their many finch-like features. The third branch contains everything else — the goldfinches, rosefinches, greenfinches, Purple Finches, siskins, serins, crossbills, and canaries. And yes, the grosbeaks. Hawaiian honeycreepers belong here too; we now know they’re descended from a group of Eurasian rosefinch-like finches that somehow strayed all the way to an emerging volcanic archipelago in the middle of the vast Pacific Ocean and there diversified into the spectacular Iiwi, Laysan Finch, Akohekohe, and Maui Parrotbill, to name just a few. Nine species of grosbeaks form the first smaller branch within this third great branch of finches. All nine are large, stocky finches with massive and powerful bills. Four are stunning black and yellow South Asian species in the genus Mycerobas, among them the Black-and-yellow Grosbeak and the Spot-winged Grosbeak (the bird shown at the link is a male, not a female as the caption incorrectly states). The Evening Grosbeak’s closest relative is the Hooded Grosbeak of Mexico and Guatemala. The Hawfinch of Eurasia appears to be a fairly close relative of Evening and Hooded Grosbeaks. All three are currently placed in the same genus, Coccothraustes, by the American Ornithologists’ Union. 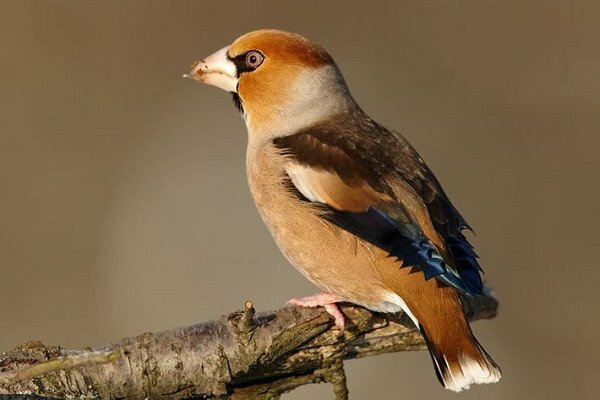 Hawfinch (Coccothraustes coccothraustes) cc-by-sa Martin Mecnarowski. Check out those fancy blue inner primaries! 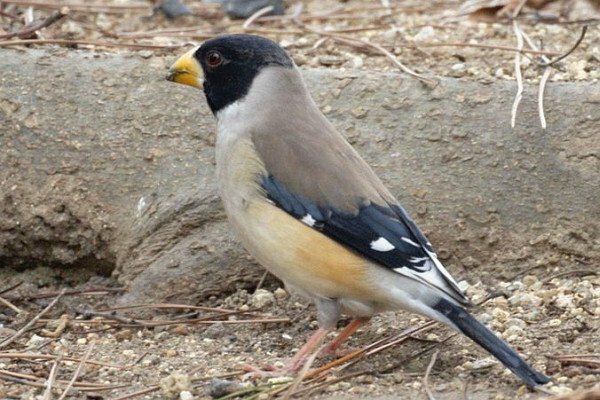 Two East Asian species, the Chinese Grosbeak (Eophona migratoria) and Japanese Grosbeak (Eophona personata) are also close relatives. In fact, there is some uncertainty as to whether these two are more closely related to Hawfinch than Hawfinch is to Evening Grosbeaks. If this is true, Evening and Hooded Grosbeaks cannot be left in Coccothraustes unless Eophona is also lumped in with them. 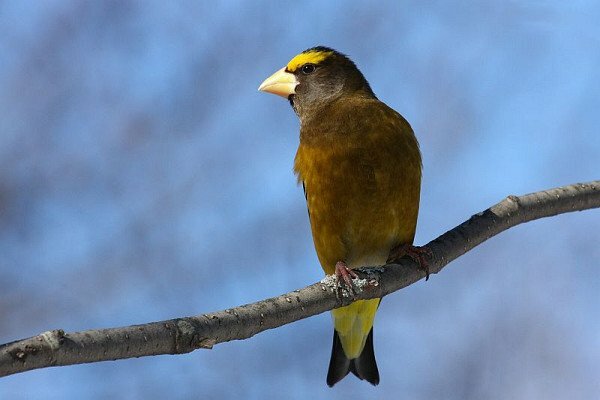 An alternative would be to place Evening and Hooded Grosbeaks back in their own genus Hesperiphona. However, the Zuccon et al. study referenced above does not resolve the question of relationships among these five species, so the AOU will undoubtedly retain Evening Grosbeak (and its southern cousin) within Coccothraustes until something conclusive is found. Some of you may be wondering why I haven’t mentioned Pine Grosbeak (Pinicola enucleator). Pine Grosbeak is indeed a finch; however, it is most closely related to the Eurasian and Indomalayan bullfinches (Pyrrhula), not to the nine grosbeaks we’ve just discussed. Thanks for the nice, informative treatise on grosbeaks. 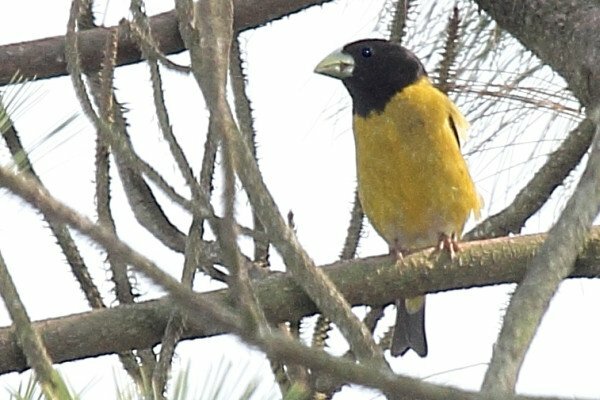 That Black-and-yellow Grosbeak is stunning indeed!